This sleek and contemporary dark taupe work desk is the perfect combination of function, durability and design in a modern form. 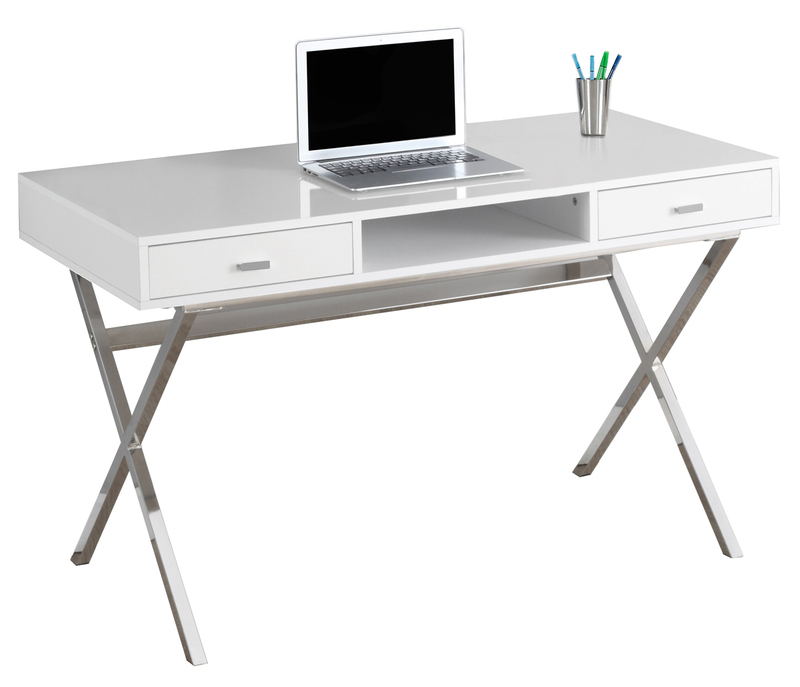 With clean lines, thick panel construction and silver track metal legs, this desk will add pizzazz to any home office. The desk top provides the ideal surface space for a lamp, picture frames, laptop or tablets to meet your working needs. This simple yet practical 3pc desk set is the perfect addition to your home office. 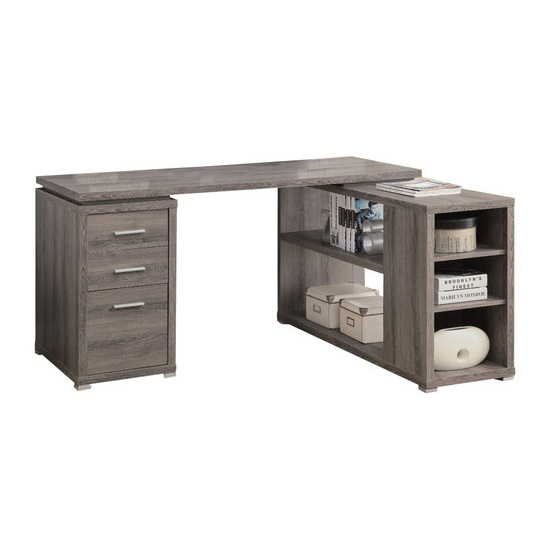 The dark taupe reclaimed wood-look finished desk can conveniently be placed on the left or right side offering you multi-functionality. The side drawers provide you with space to store office supplies, papers, books, files folders, and plenty more. Use the spacious surface for your computer, a lamp and even some pictures. 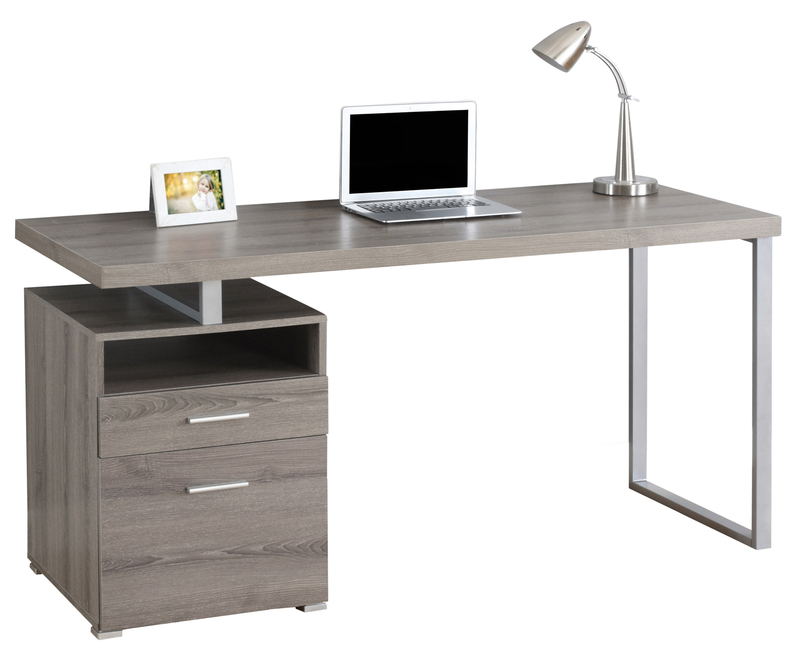 Sleek and contemporary, this extra-long L shaped corner computer desk is the perfect combination of function, durability and design in a modern form. Finished in dark taupe reclaimed look on all sides, this work station with the thick floating tops and sleek track metal legs adds pizzazz with practicality to any home office. Featuring two large storage drawers and a file drawer to help keep you organized, which can conveniently be assembled on the left or right hand side, with plenty of desktop surface for your all your working needs. This highly functional desk is a must-have for any home business! 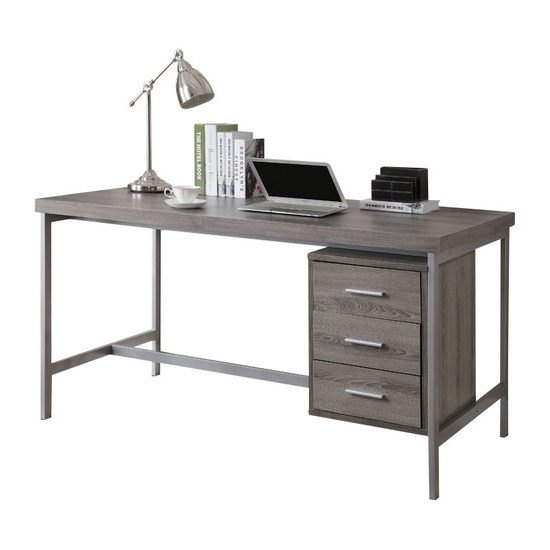 Sleek and contemporary, this dark taupe distressed-look finished desk is the perfect combination of function, durability and design in a modern form. 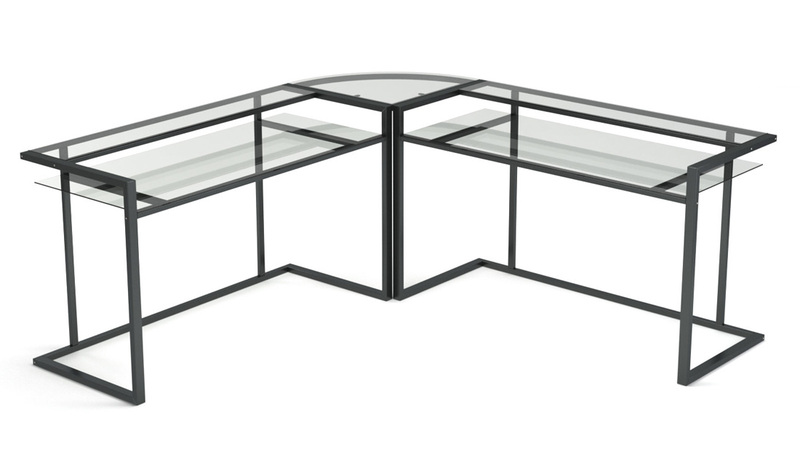 With clean lines, a floating top work station and sleek track metal legs, this piece will add pizzazz to any home office. Featuring an open concept shelf, a storage drawer and a file drawer accented by silver colored drawer pulls to help keep your office supplies and documents organized and desktop clutter free. The large thick paneled surface provides plenty of room to meet your working needs without compromising style. Create a professional looking workspace when you outfit your home office with this L-shaped corner desk. 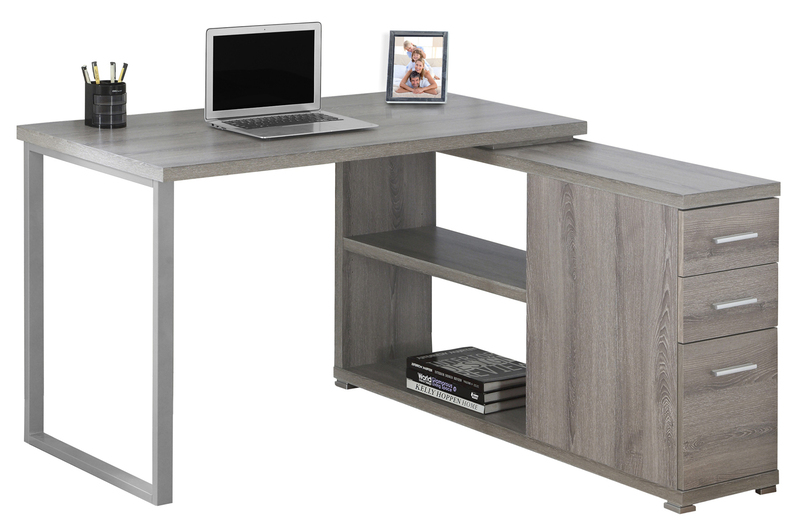 Finished in a stylish dark taupe reclaimed wood-look, this structured, modern L-shaped desk creates ample storage space and provides a broad work surface in your home office. This stylish and functional executive desk contains a wide variety of drawers and cabinets for multiple uses, allowing you to keep your work surface clean and uncluttered. This simple yet practical "hollow-core" desk is the perfect addition to your home office. 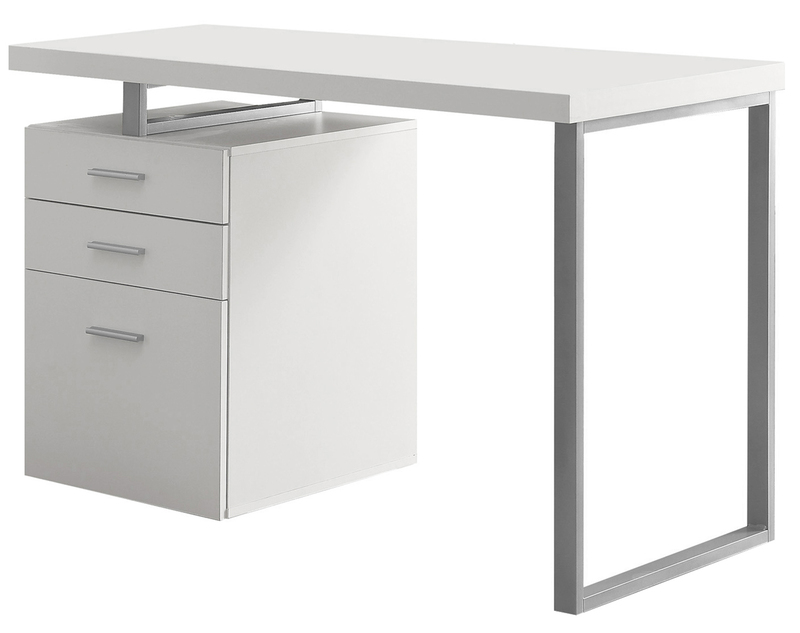 Finished in a chic white, this desk can conveniently be placed on the left or right side offering you multi-functionality. The convenient side drawers provide you with space to store office supplies, papers, books, files folders, and plenty more. Use the spacious top for your computer, a lamp or even pictures. This 48" long desk with fit in perfectly into any space. This modern, high gloss desk is the ideal computer workstation for your home office. The stylish criss-cross silver metal legs provide study support while the white glossy finish adds style. This practical yet fashionable desk offers ample surface room, 2 storage drawers for your office supplies and one open concept shelf perfect for storing away your laptop and other accessories. This simple yet practical "hollow-core" desk is the perfect addition to your home office. The natural reclaimed wood-look finished desk can conveniently be placed on the left or right side offering you multi functionality. The side drawers provide you with space to store office supplies, papers, books, files folders, and plenty more. Use the spacious top for your computer, a lamp and even some pictures. This 48" long desk with fit in perfectly into any space. Sleek and contemporary, this rich cappuccino finished desk is the perfect combination of function, durability and design in a modern form. 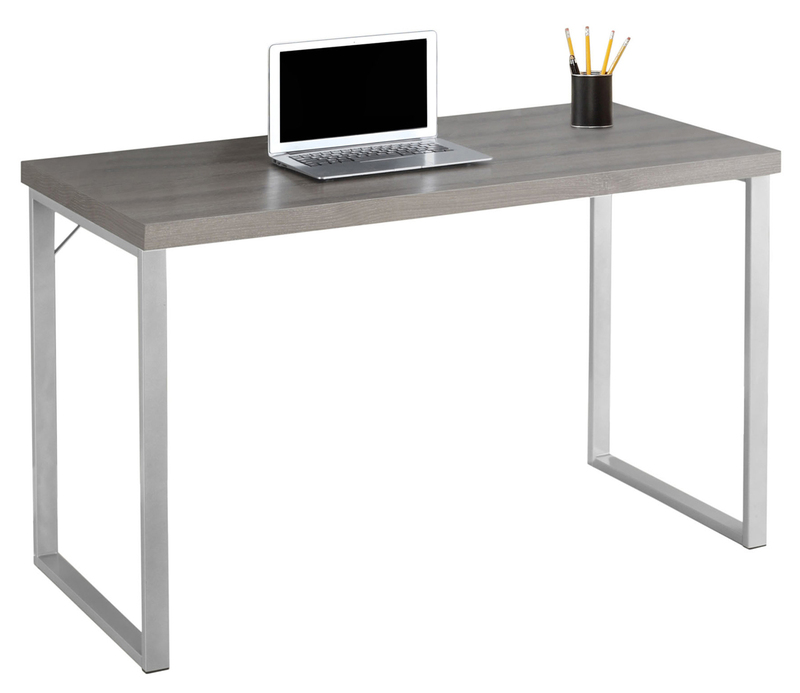 With clean lines, a floating top work station and sleek track metal legs, this piece will add pizzazz to any home office. Featuring an open concept shelf, a storage drawer and a file drawer accented by silver colored drawer pulls to help keep your office supplies and documents organized and desktop clutter free. The large thick paneled surface provides plenty of room to meet your working needs without compromising style. Sleek and contemporary, this white finished desk is the perfect combination of function, durability and design in a modern form. 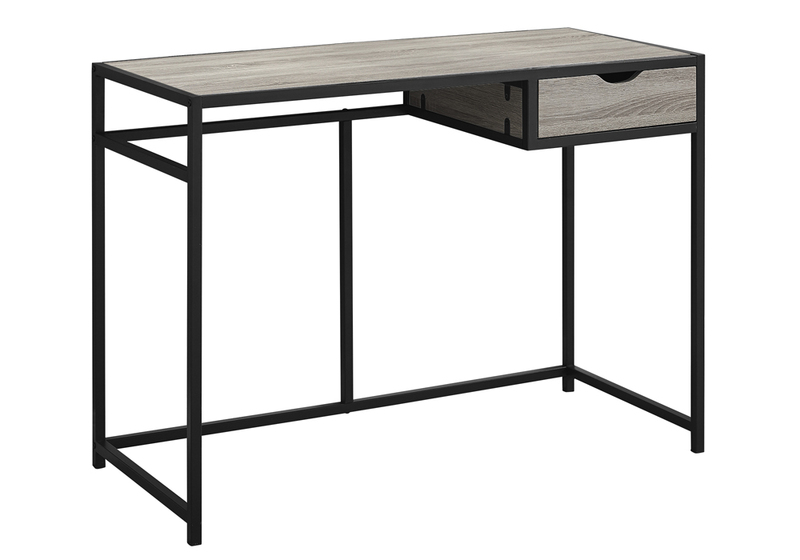 With clean lines, a floating top work station and sleek track metal legs, this piece will add pizzazz to any home office. Featuring an open concept shelf, a storage drawer and a file drawer accented by silver colored drawer pulls to help keep your office supplies and documents organized and desktop clutter free. The large thick paneled surface provides plenty of room to meet your working needs without compromising style. Sleek and contemporary, this extra-long L shaped corner computer desk is the perfect combination of function, durability and design in a modern form. 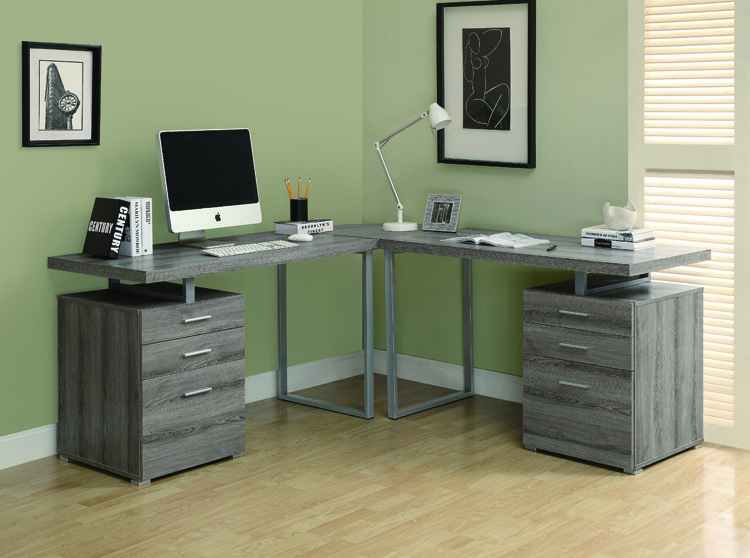 Finished in an elegant grey wood-look on all sides, this work station with the thick floating tops and sleek track metal legs adds pizzazz with practicality to any home office. Featuring two large storage drawers and a file drawer to help keep you organized, which can conveniently be assembled on the left or right hand side, with plenty of desktop surface for your all your working needs. This highly functional desk is a must-have for any home business! Sleek and contemporary, this extra-long L shaped corner computer desk is the perfect combination of function, durability and design in a modern form. Finished in rich cappuccino on all sides, this work station with the thick floating tops and sleek track metal legs adds pizzazz with practicality to any home office. Featuring two large storage drawers and a file drawer to help keep you organized, which can conveniently be assembled on the left or right hand side, with plenty of desktop surface for your all your working needs. This highly functional desk is a must-have for any home business! Sleek and contemporary, this white finished desk is the perfect combination of function, durability and design in a modern form. With clean lines, a large, thick paneled surface and stylish silver metal legs, this piece will add pizzazz to any home office. Featuring a large storage drawer and a file drawer accented by silver colored drawer pulls to help keep your office supplies and documents organized and desktop clutter free. 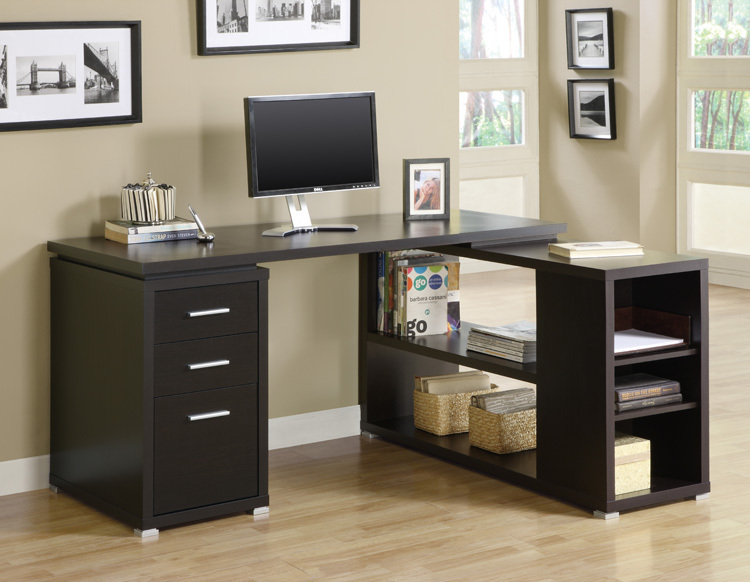 This desk provides plenty of room to meet your working needs without compromising style making this a must have in any home office. This simple yet practical "hollow-core" desk is the perfect addition to your home office. 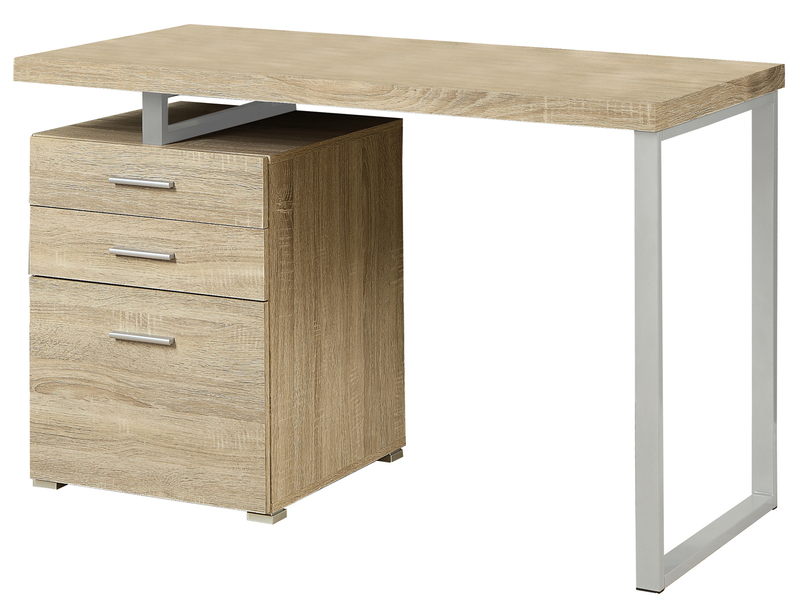 The dark taupe reclaimed wood-look finished desk can conveniently be placed on the left or right side offering you multi-functionality. The side drawers provide you with space to store office supplies, papers, books, files folders, and plenty more. Use the spacious surface for your computer, a lamp and even some pictures. This 48" long desk fits perfectly in any space. Create an industrial yet simple style to your home with this 3 drawer, dark taupe, reclaimed wood-look, hollow-core desk. 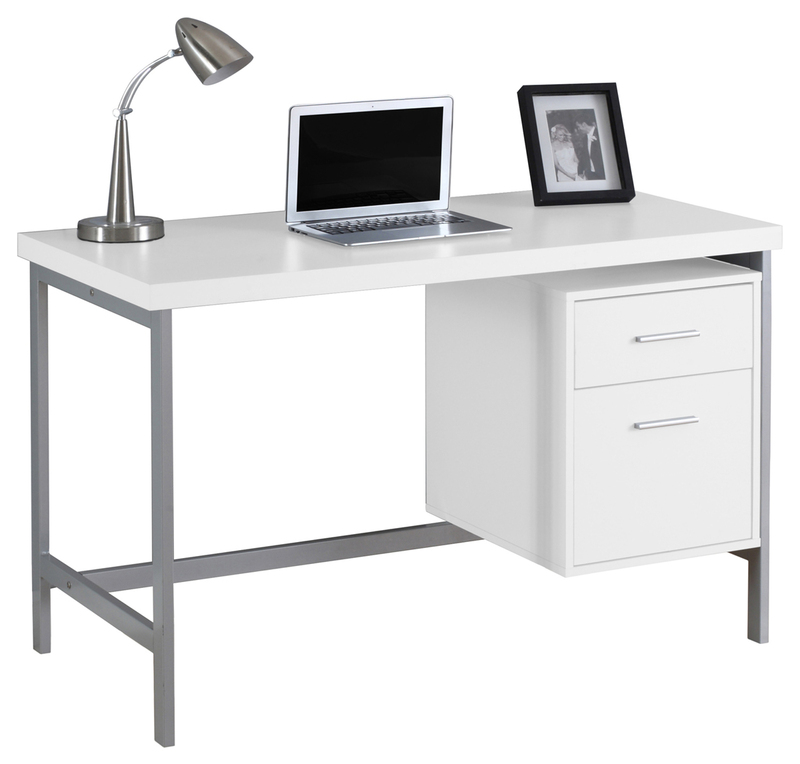 A beautiful silver metal frame supports this broad surface work station with generous drawer storage. This hollow-core "L" shaped computer desk will be a stunning focal point in your contemporary home office. This simple and stylish piece features thick panels and clean lines, in a dark taupe reclaimed wood-look finish. The writing desk offers a spacious work surface that is great for doing paperwork, or for using with a computer. The secondary surface offers an additional work space, and extra shelves that can be used for a printer or other important items. This piece also features two medium storage drawers and a convenient lateral file drawer below to help keep you organised. Its silver colored handles and feet boldly accent the piece making it a must-have for any home. This simple, minimalist computer desk offers a compact work space that is ideal for apartments, condos and other small spaces. 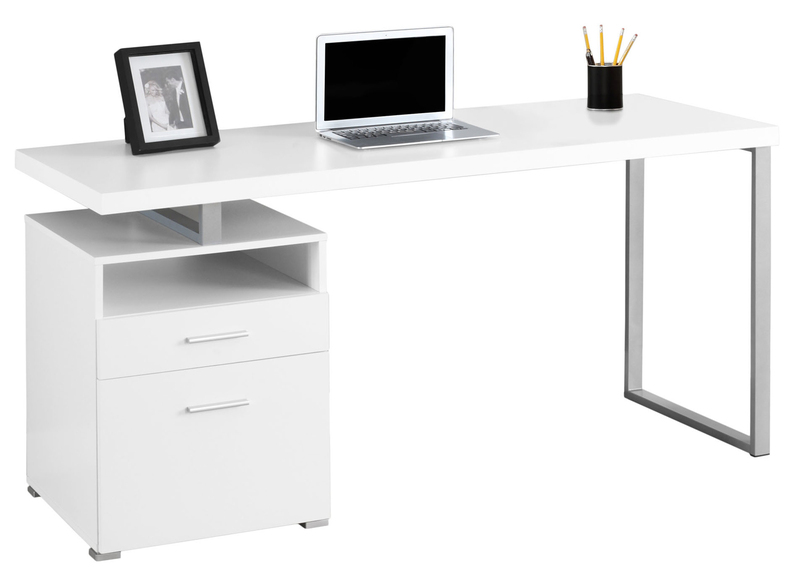 With clean lines in a bold white finish, this desk will blend easily with your home decor. The top ladder style shelves can be used to display pictures and decorative pieces while the ample surface area provides enough room for a laptop and other office essentials. 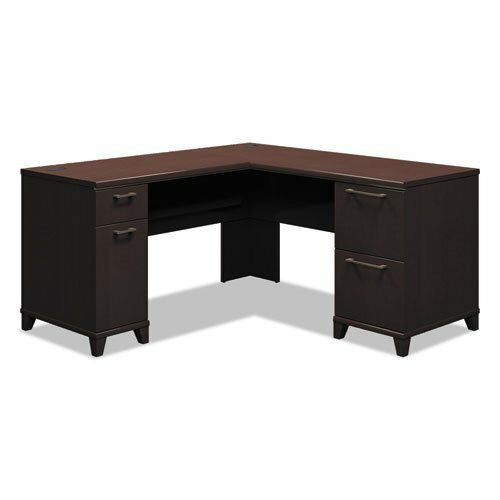 Add this convenient piece to your home for a functional workstation, where ample storage options, excellent functional features, and sophisticated style come together. 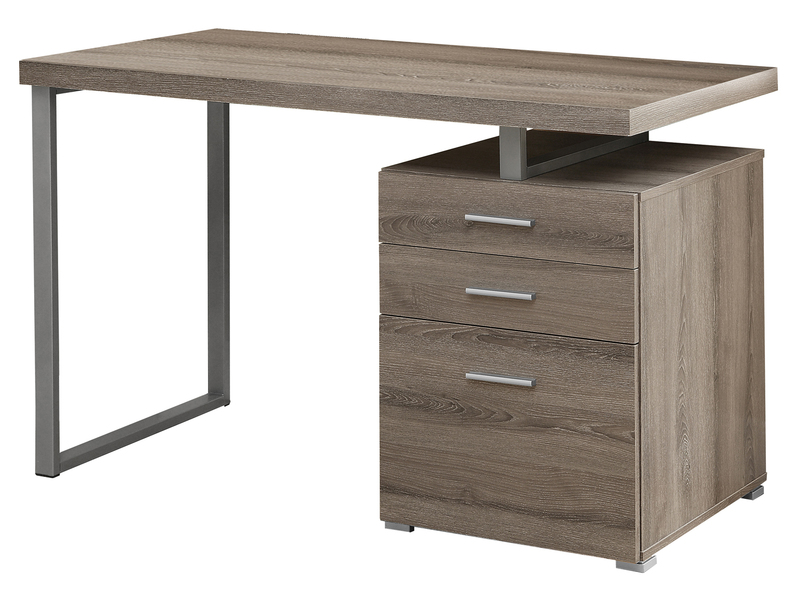 Sleek and contemporary, this dark taupe finished desk is the perfect combination of function, durability and design in a modern form. With clean lines, a large, thick paneled surface and stylish silver metal legs, this piece will add pizzazz to any home office. Featuring a large storage drawer and a file drawer accented by silver colored drawer pulls to help keep your office supplies and documents organized and desktop clutter free. 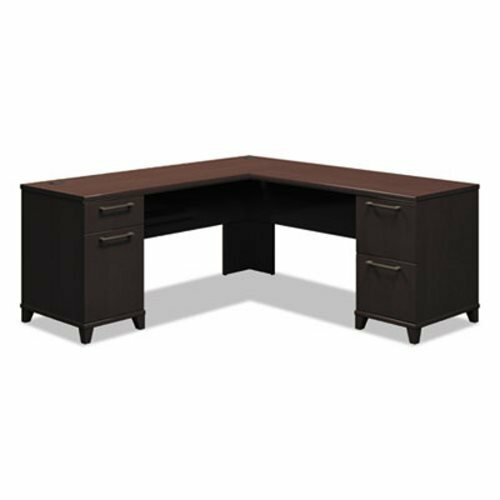 This desk provides plenty of room to meet your working needs without compromising style making this a must have in any home office. 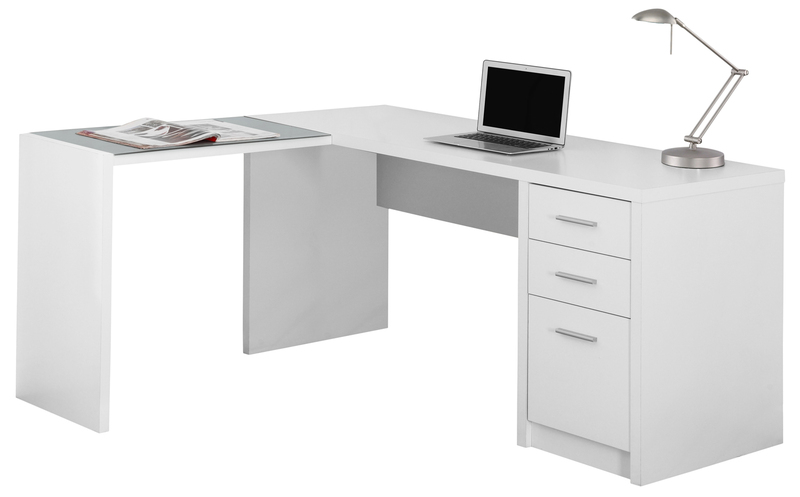 Upgrade your home office with this contemporary style L-shaped corner styled desk with an expansive desk top, finished in a crisp white tone on all sides. The desk portion provides 3 convenient storage drawers for your office supplies and paperwork, including a file cabinet fitted for legal sized folders. The handy side table is partially topped with a piece of 5mm thick tempered glass which not only protects the desk surface, but gives it that extra luminance. Whether you place in a corner or in the middle of the room, this clean lined desk with thick panelling will be a stand-out in any area. Assembly is required. 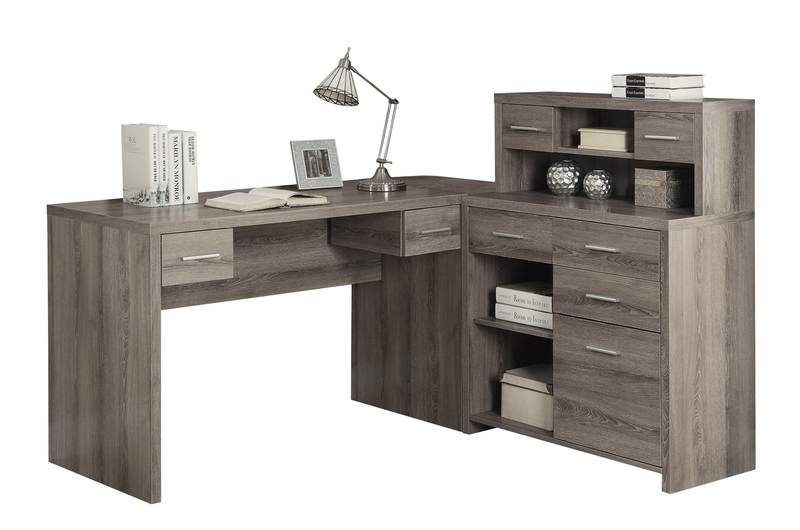 Upgrade your home office with this contemporary style L-shaped corner styled desk with an expansive desk top, finished in a stylish dark taupe reclaimed wood-look on all sides. The desk portion provides 3 convenient storage drawers for your office supplies and paperwork, including a file cabinet fitted for legal sized folders. The handy side table is partially topped with a piece of 5mm thick tempered glass which not only protects the desk surface, but gives it that extra luminance. Whether you place in a corner or in the middle of the room, this clean lined desk with thick panelling will be a stand-out in any area. Assembly is required. Sleek and contemporary, this extra-long L shaped corner computer desk is the perfect combination of function, durability and design in a modern form. 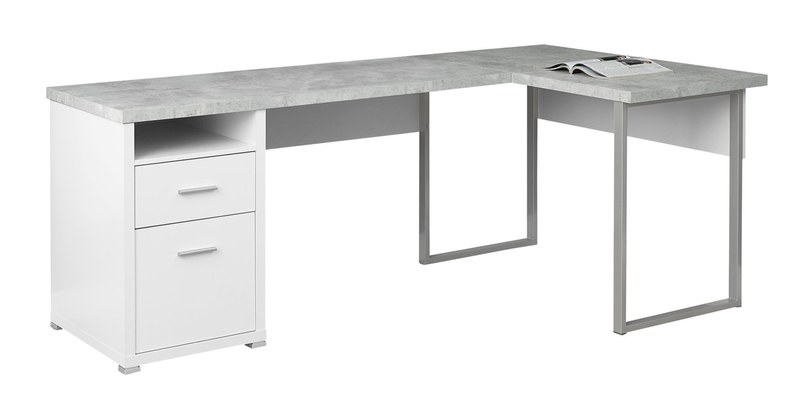 Finished in a chic grey cement-look top with white on all sides, this work station with the thick floating tops and sleek track metal legs adds pizzazz with practicality to any home office. Featuring two large storage drawers and a file drawer to help keep you organized, which can conveniently be assembled on the left or right hand side, with plenty of desktop surface for your all your working needs. This highly functional desk is a must-have for any home business! 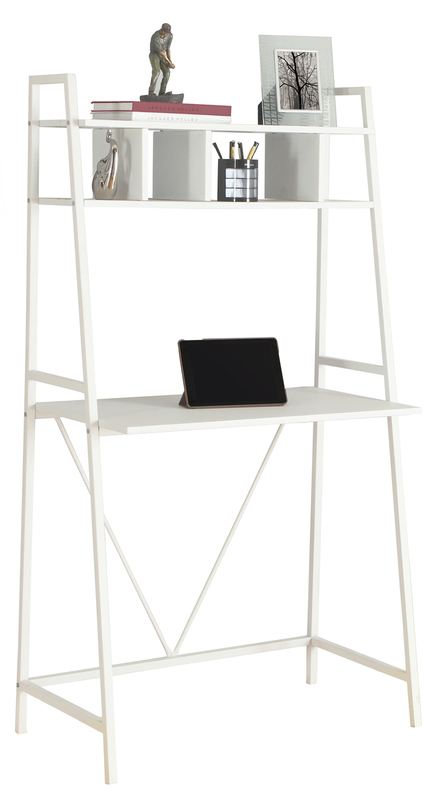 This simple yet practical "L" shaped desk will be the perfect addition to your home office. 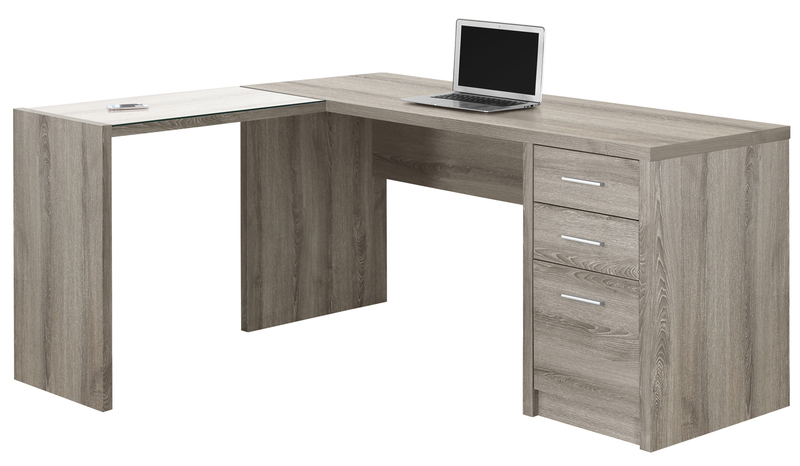 This two tone finish desk which can be configured on the left or right hand side is the right combination of function, durability and design in a modern form. The convenient side drawers provide you with space to store office supplies, papers, files folders, and plenty more. Use the spacious top for your computer desk top, laptop or tablets. Featuring an open concept shelf, a storage drawer and a file drawer accented by silver colored drawer pulls to help keep your office supplies and documents organized and desktop clutter free. Sleek and contemporary this "L" shaped computer desk will be a stunning focal point in your contemporary home office. With clean lines, thick panel construction and sleek track metal legs, this desk is the perfect combination of function, versatility and design in a modern form. 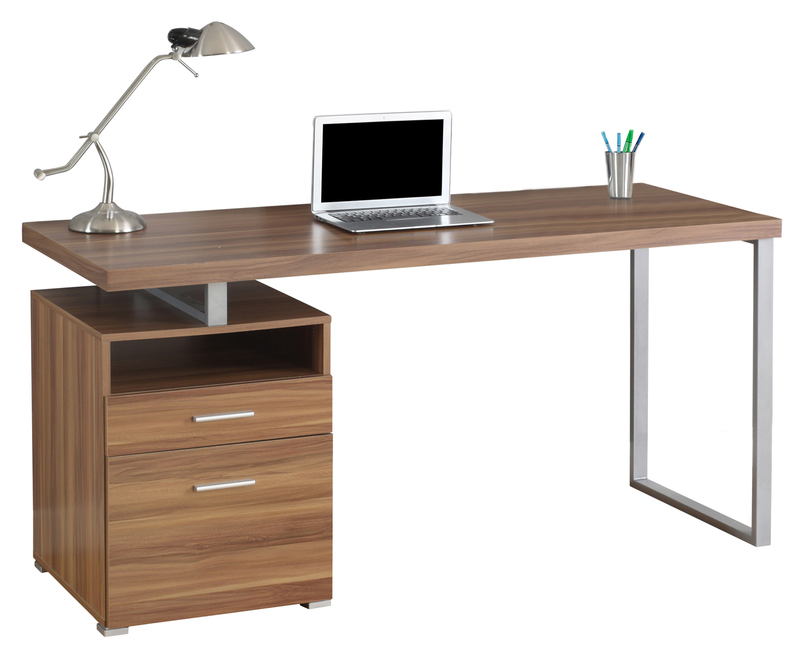 The desktop offers a spacious work surface to meet your working needs without compromising style. The side surface offers an additional work space with open concept adjustable shelves that can be used for additional storage. The two medium drawers and file drawer will to help to keep documents and clutter organised without sacrificing storage space. The piece can conveniently be assembled on the left or right side, making this unit uniquely yours to design. Left or right facing configuration making this unit uniquely yours to design. This hollow-core "L" shaped computer desk will be a stunning focal point in your contemporary home office. This simple and stylish piece features thick panels and clean lines, in a deep cappuccino finish. The writing desk offers a spacious work surface that is great for doing paperwork, or for using with a computer. The secondary surface offers an additional work space, and extra shelves that can be used for a printer or other important items. This piece also features two medium storage drawers and a convenient lateral file drawer below to help keep you organised. Its silver colored handles and feet boldly accent the piece making it a must-have for any home. 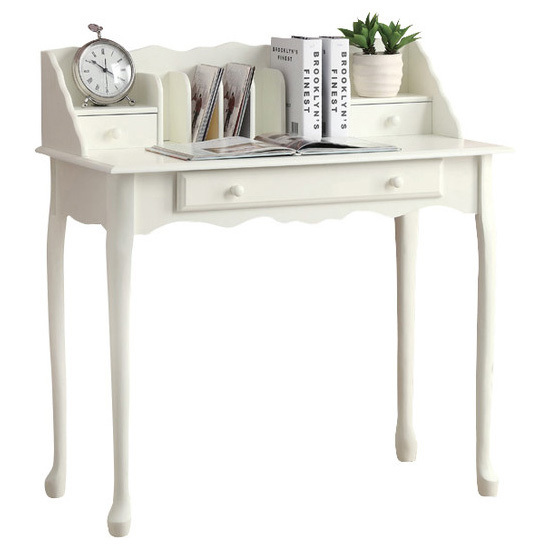 This traditional antique white secretary desk will add warmth and refinement to your living space. The scalloped trim apron and Queen Ann styled legs provide a timeless look that will blend effortlessly with your home décor. Quality built, with solid wood legs, this French inspired desk will provide you with years of lasting enjoyment, while keeping you organized. Three storage drawers help keep clutter hidden while vertical slots are the perfect place to store mail, books or documents. The surface space provides ample room for a laptop or tablet to meet your working needs. Ideal for smaller spaces, this piece will be a great addition to your home office, bedroom or even entryway. Six vertical slots ideal for organizing mail, books, magazines and documents. 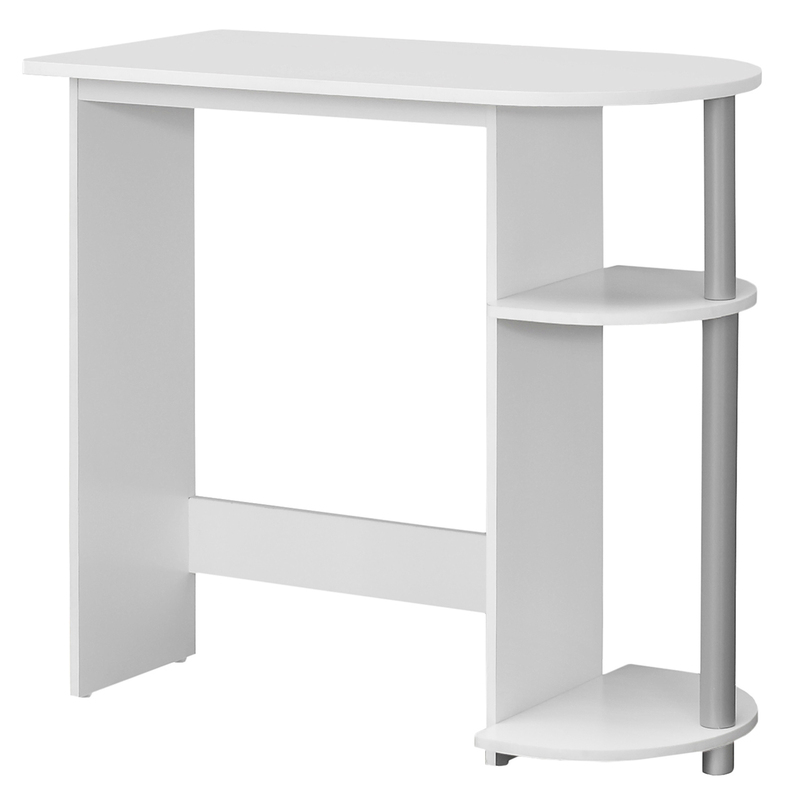 Clean lines and a simple style make this white juvenile desk a wonderful addition to any student's room. Ample surface area for writing or working on a laptop and 2 open concept shelves for textbooks and school supplies make this desk perfect for homework time. The sleek silver colored post offers extra support and rounds off the sharp modern look. This contemporary two tone industrial look work desk is the perfect combination of function, durability and design in a modern form. 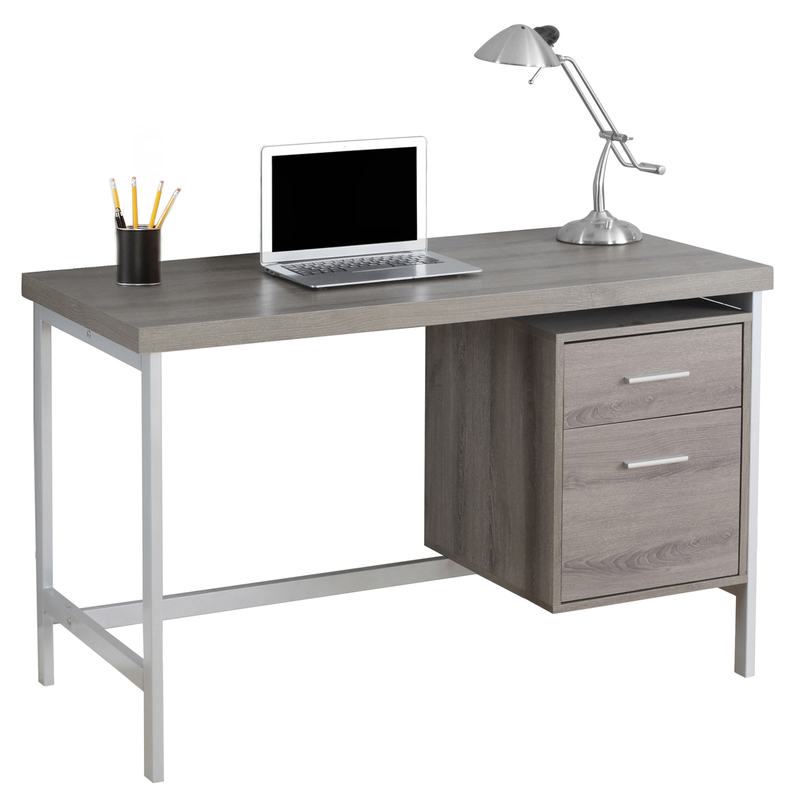 With clean lines, a chic dark taupe surface area and sturdy sleek metal legs, this desk will add pizzazz to any home office or dorm room. The desk top provides ample surface area for a lamp, laptop or tablet while the drawer provides hidden storage for all of your additional office supplies. 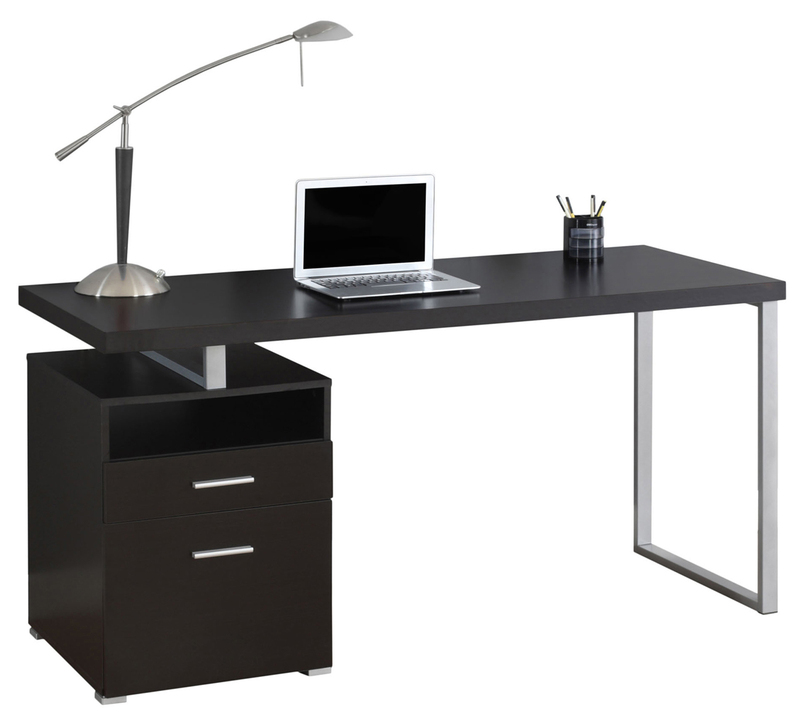 Enterprise Collection L-Desk for transitional styling that creates a professional impression anywhere. Constructed with 100% thermally fused laminate for durability and superior resistance to scratches and stains. This L-Desk provides an integrated 4-port USB hub in the desk to connect electronic devices. Our dual pedestals offer metal drawer pulls for contemporary styling and durable edge banding to resist dents. One pedestal has a top drawer, storage compartment with an adjustable shelf and self-closing Euro-style door hinges. Two additional file drawers in the second pedestal, accommodating letter, legal or A4-size files. Full-extension ball bearing drawer slides and suspension allow easy access to files. Color: Mocha Cherry; Pedestal Count: 2; Top Shape: L-Shape; Top Material: Melamine. A contemporary classic with clean lines and modern silver metalwork. Thermally fused woodgrain laminate is scratch-, dent- and water-resistant. Commercial-grade 1" thick elevated worksurface stands up to heavy use. Two grommets for cable management and full-width punched metal modesty panel. Leveling glides help compensate for uneven floors. Can be combined with Return/Bridge Shell and Credenza Shell to form an "L" or "U" workstation. Color: Espresso; Top Shape: Rectangular; Top Material: Woodgrain Laminate; Top Thickness: 1".